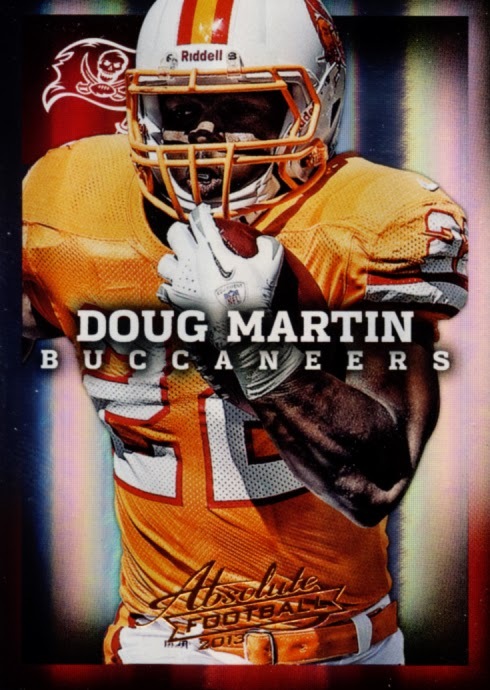 Anyone who follows this blog knows that Absolute tends to be a good break for me. 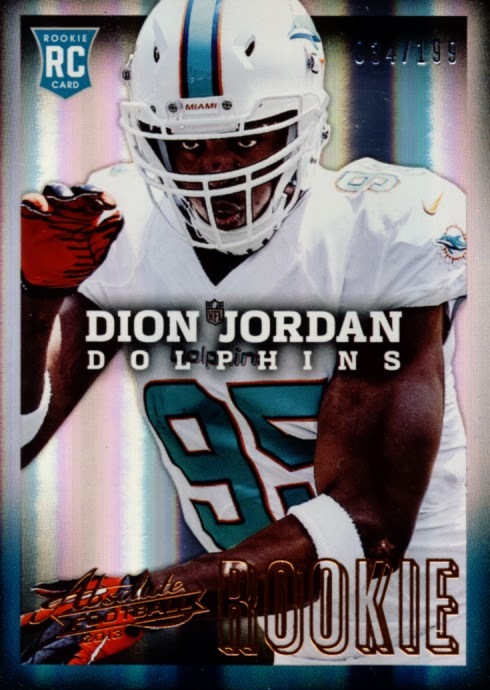 Going in I knew this could be a rough break as things have returned to normal after two years of way above average rookie classes dominated the NFL. 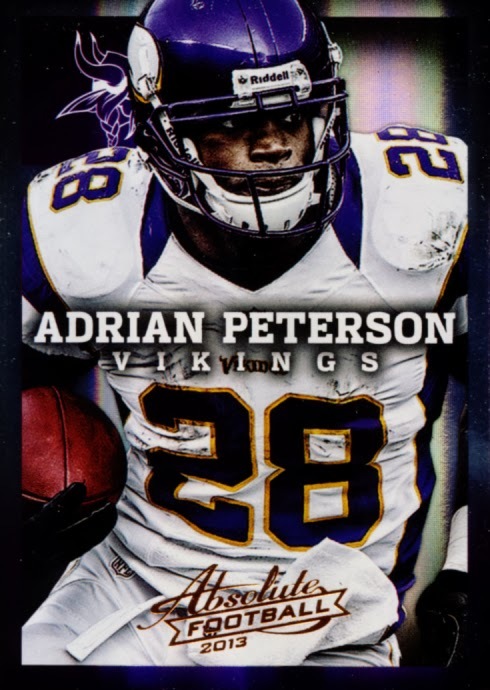 While instant rip and flip values might not be on par with 2011 and 2012, what remains is a really nice base set, a cool new insert set and some great hits to pull making 2013 Panini Absolute Football another solid choice for Football card collectors. 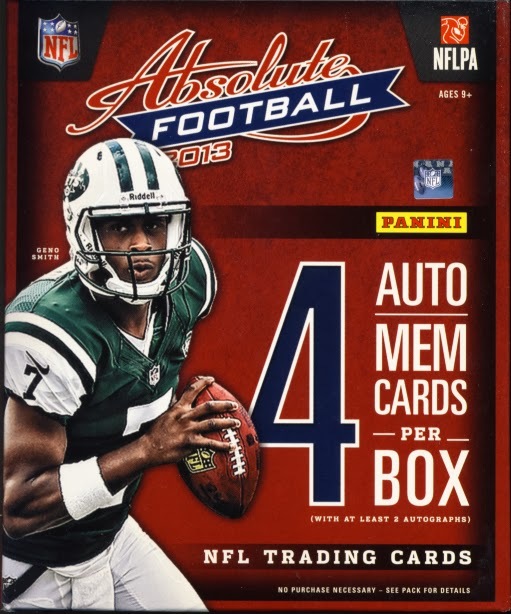 Panini Absolute Football falls squarely into our premium cards category. Each box contains four pillow packs with 4 cards per pack. 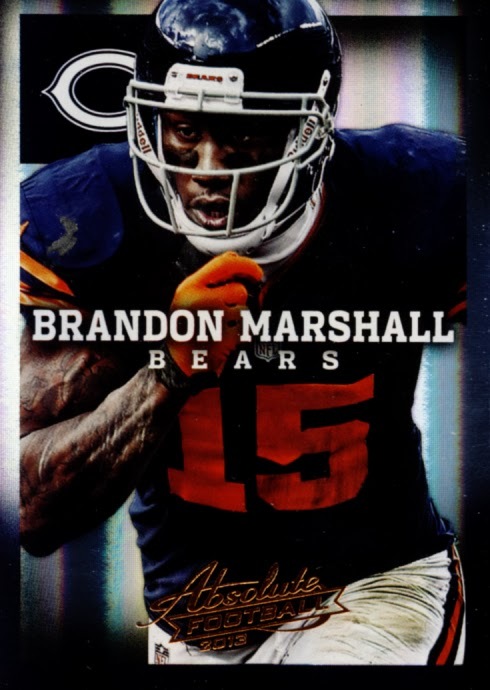 Each master box contains four Autograph or Memorabilia cards with at least two autographs. 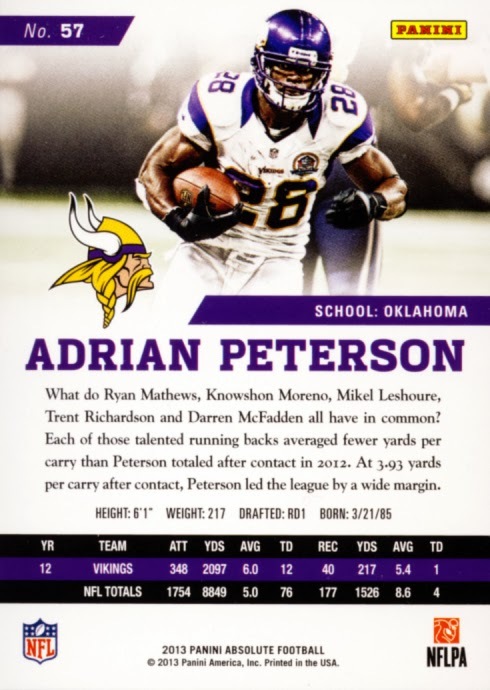 The base cards this year have gone bold with some close up photography and simplified layout. 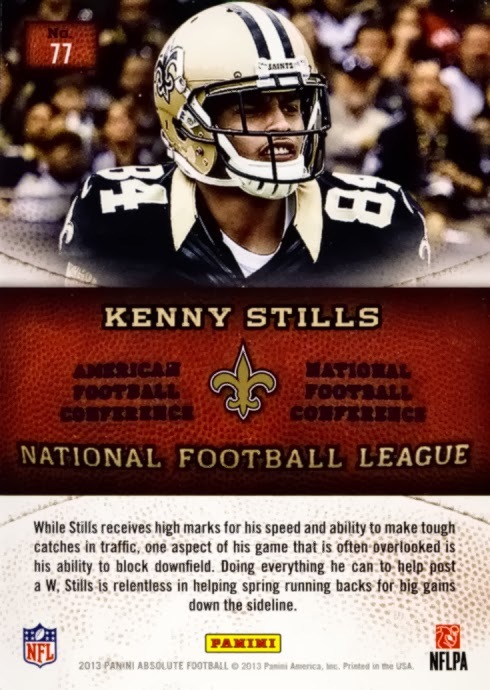 Those good looks continue to the backs of the cards, offering alternate photos, which is always appreciated, a nice write up and stat line. 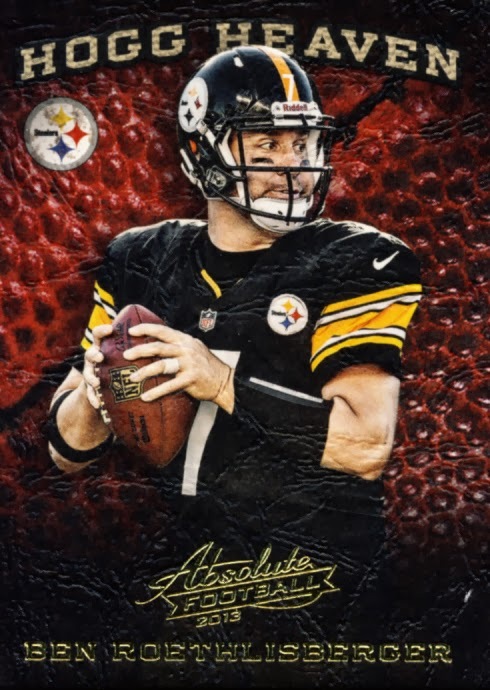 Inserts return this year with the cool, textured Hogg Heaven cards. 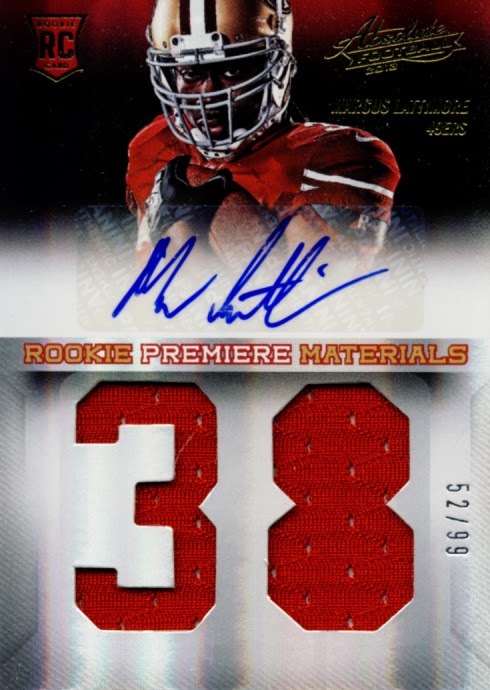 The RPM Rookie Autographs are, once again, the standouts of the product and provide the exact date identification of the memorabilia swatch which is also appreciated. 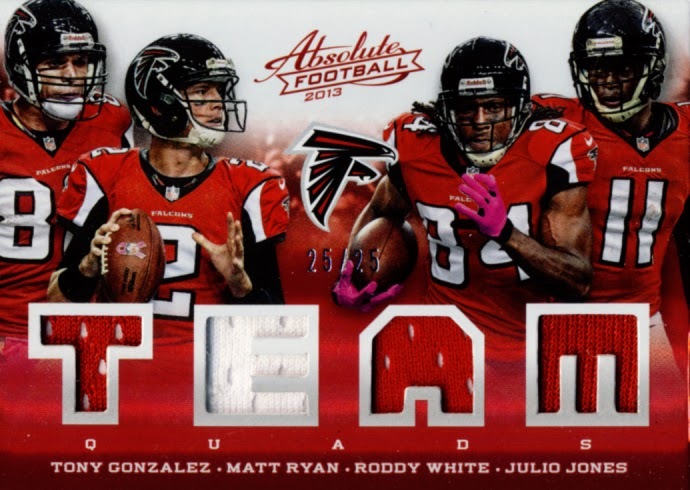 This checklist is tight and while rookie centric, there is still a nice variety of veterans included. 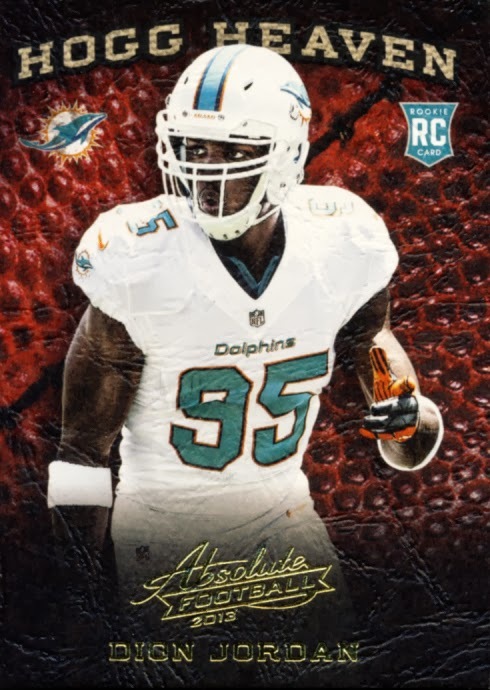 There is plenty of goodness that can be had with Absolute. 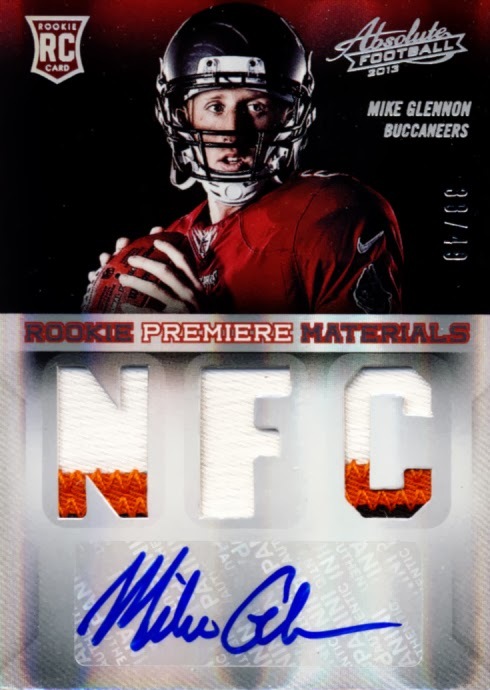 While RPM Rookie Autographs will always be the highlight, Tools of the Trade autos materials with names like Marino, Montana and Elway, Autoed War Room NFL Draft Day Tickets, Patches and Plates Autos, and Leather and Laces Mem cards earn their place as premium hits too. 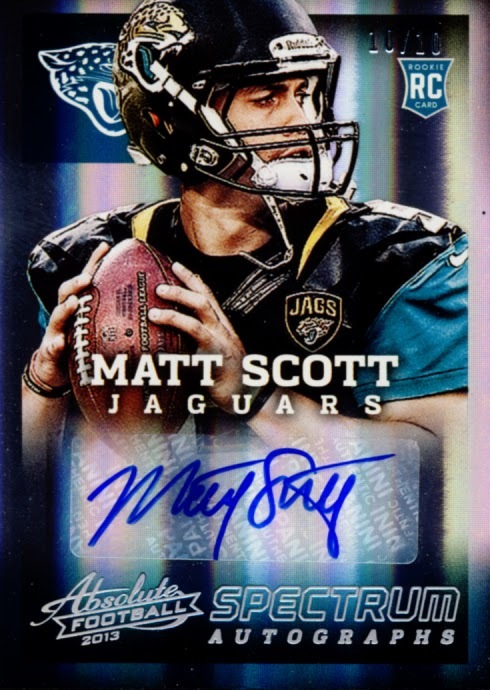 For some, a second box is an easy purchase and for those with deeper pockets, getting a case of these will seem reasonable. 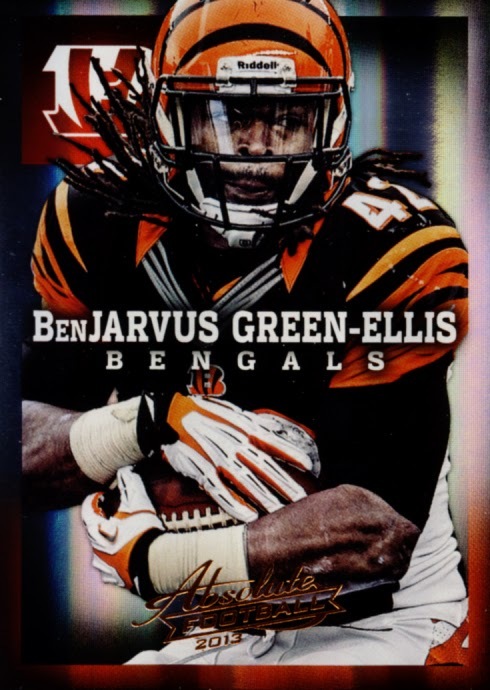 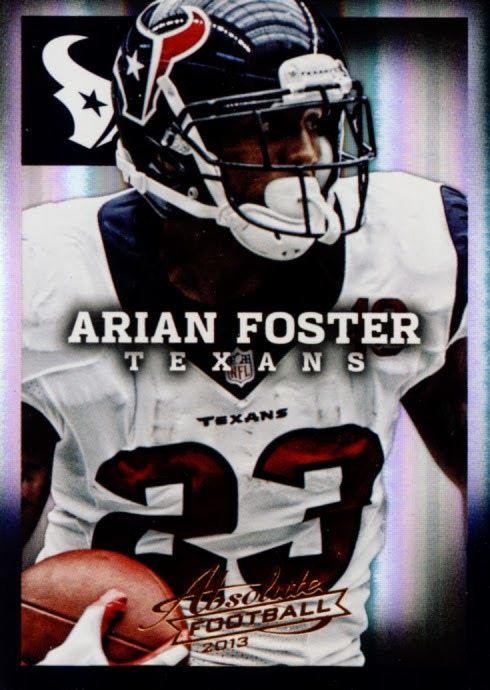 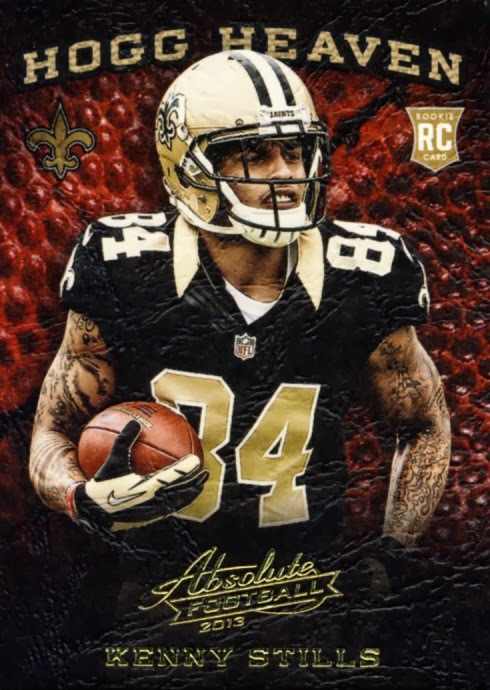 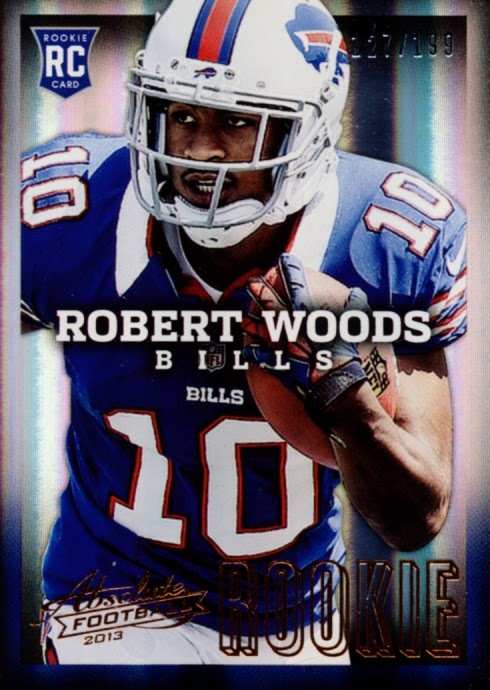 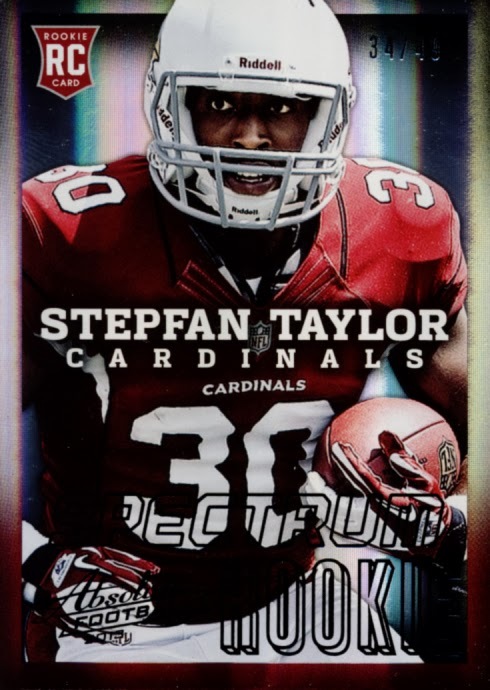 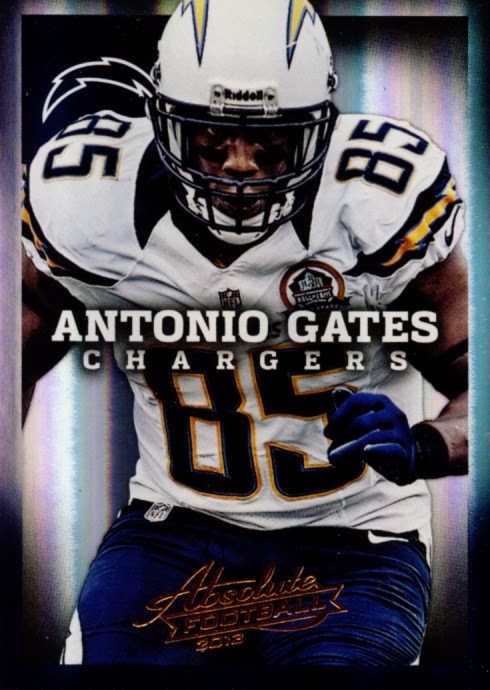 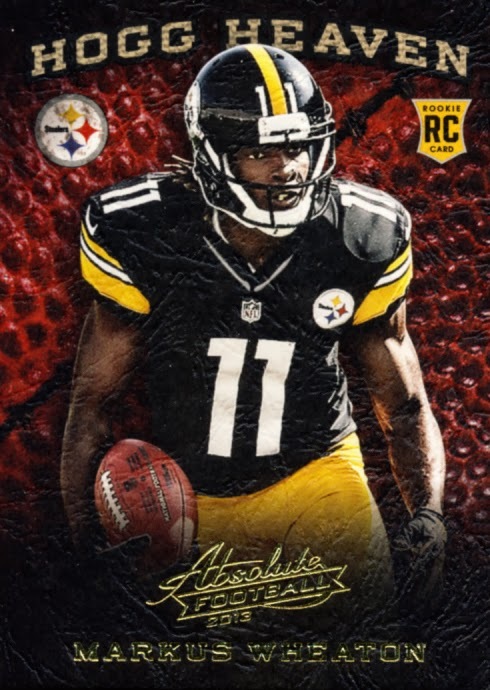 2013 Panini Absolute Football is a fun break that can provide some high end premium cards for hit seekers while also serving the needs of rookie prospectors. 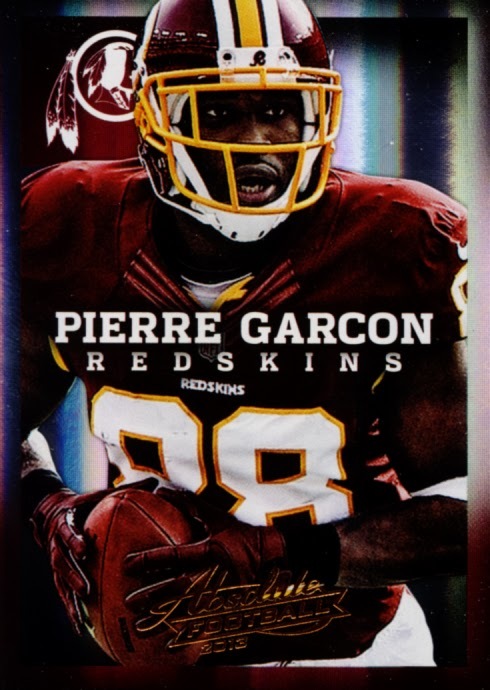 WOW don't like the base card photo cropping at all on these cutting off arms, part of helmets, balls etc. 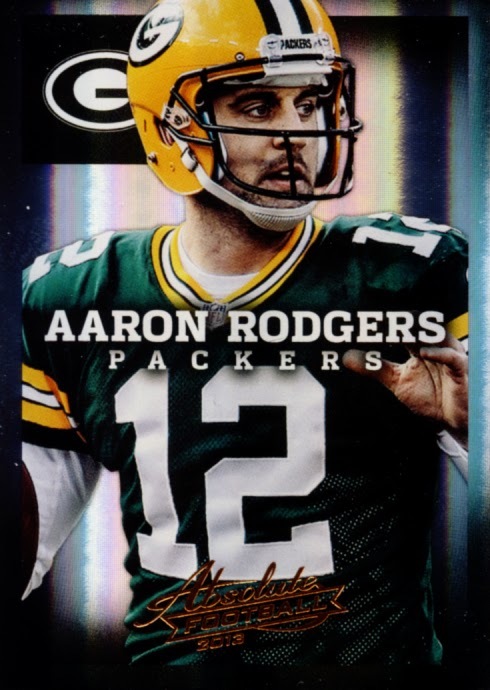 Photos are just to tight/big on the card for my liking. 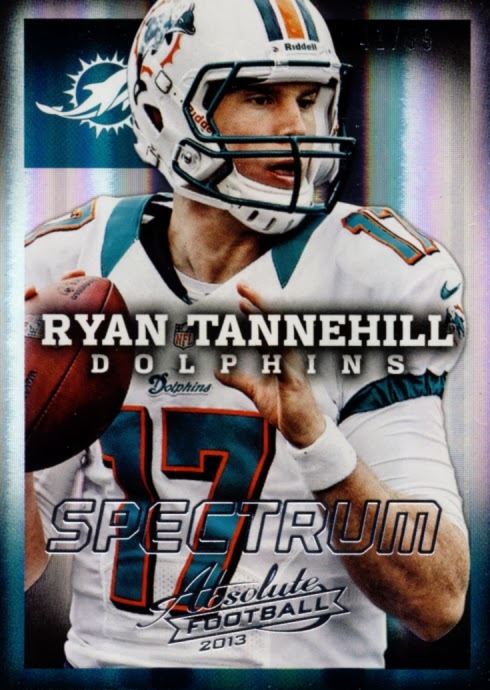 I do like the Hogg Heaven cards tho.